Michel Selim Nash Sáez was born July 1st 1954 in Santiago, Chile. He was a beautiful baby, with big eyes and long eyelashes that gave him the look of a dreamer. Curious and eager to learn. First son, a father of Syrian descent. Spoilt by the family, loved by his aunties and grandmother, adored by his parents. He was lucky that his father, due to his job, had time to spend with him, and for a lot of the time both parents were at home. Conversations at lunchtime always consisted of a 1001 topics, everything was discussed: science, history, politics, discoveries, etc. His father was a communist and he talked about his ideas, but always in a wider context, integrating them with everyday life and its contradictions. It was an era of big, bold advances and discoveries, we saw the first cosmonaut Laika the dog, the first human astronaut, the first woman … and then we saw man reach the moon, all that excited the imagination. Mathematics was part of the conversation, numerical puzzles, knowledge tests of geography and history, revolutions, leaders …. and martyrs. Hunger in Africa, illiteracy in Latin America, particularly in Chile, new vaccines, new speed records … so many things that made every conversation a universe. He was a child of great imagination, with a great interest in reading. Very sociable, as he always had many playmates and friends. Reading comic books first and then books, led him to discover a vast world, knowledge that he would later pass on to his games: Tarzan, cowboys, conquerors, explorers, unknown places were his world, in which his imagination would run and he would re-enact them in the yard of his house where his friends were given roles by him and he would always play the role of captain of the ship or the head of the tribe or whichever role was in charge. He was always tall and thin build, hazel eyes and hair with slight waves. His dreamy eyes gave him a gypsy look, that caused havoc with the women, so much so that the phone was always ringing, he always had a date. He joined the Communist Youth and got involved in the change that was happening, he actively participated in the presidential campaign of Salvador Allende; believing he would win, “Mom, you have to vote for Allende” he said, a little sad because he could not vote that year as he was only 16. But he participated in painting murals and putting up posters, formed a brigade of the Popular Unity in an area which was largely rightwing, and won people over with his charisma, convincing them with his sheer vehemence and conviction. He had political discussions with people from different backgrounds, without hesitation, whether of his own party or others on the left or right. It made no difference whether his interlocuter was the same age or more or less, he was able to argue and justify his ideas to convince you of what he was proposing. We saw him talking to people who were much older than him, as well as with young people who were just beginning to dabble in politics. The brigade was named after a leader of the Arab world of that time “Gammal Abdel Nasser. Michel formed a local Popular Unity group, and helped to create the Price and Supply Council to counter the boycott of food by the opposition to Allende. Most local traders agreed to participate, and people worked honestly. However there were always threatening telephone calls and someone even firebombed the front door of our house. The years of the Allende government were full of activity, a whirlpool in which you lived intensively the passions you believed in, and you fought for them. Voluntary work was part of his life, and he would leave Santiago, in 1972 he went to the mine El Salvador to work voluntarily and he had to work hard, but it made him happy with the awareness that something was being built. He managed to vote in the parliamentary elections in March 1973, happy to vote for the first time and in support of the Allende government. He also had in mind that he would soon be leaving for military service, a service that he wanted to do anyway as he saw it as, “the government needs soldiers from the people.” So great was his enthusiasm that a friend of his, one year younger, chose to go and do military service with him, voluntarily and a year before his time. Thus, in April 1973, he travelled to Iquique by train, a long three-day trip. He was full of excitement and enthusiasm. In the regiment he did well, never stopping his socialising and talking, and went on to become the Chief of Staff. He never concealed his political thoughts, and so when the military made their first attempt of a coup in Santiago, back in the regiment the news was recieved hard; shocking everyone and changing everything. It was no longer the same in the army, the weight of the jackboot was felt upon them. By September 11th 1973, things were very different. He was made to patrol the streets and make raids in the towns, which was very hard for him. It did not fit with his concept of military service to its people, not at all. It was another army. So on September 12 he asked to be discharged, stating that he did not agree with the new regime. They accepted, but on his way out of the Regiment he was arrested and taken to Telecommunications for questioning. Following the interrogation he, and his friend, were transferred to the concentration camp Pisagua as prisoners. There he met many other prisoners who, on seeing that he was a “soldier”, isolated and ignored him. Only after seeing the poor state he came back from interrogation did they approach him. He wept quietly in a corner, and fellow prisoners approached him to comfort and encourage him. Difficult to do, as they had all been tortured. Under this harsh regime he remained until September 29, 1973, when in the morning a group of officers came in to ask for volunteers for a job. Everyone put themselves forward as it would mean a change from the hard routine they were under. They began to read out the names of the volunteers who would go, but it became apparent that they already had a list of six people they had come to get. In fact, one of the named that day had not left the yard because he was sick, but they took him anyway. They took them in a jeep to the northern part of Pisagua, near the cemetery, and there forced them out of the Jeep, and made them run. They shot them all to death, according to a witness who spoke on condition of anonymity, using a machine gun attached to the Jeep. Then they threw them in a pit, and the commander of the regiment came back “outraged”, complaining farcically that they had tried to escape and he had had to shoot them, and stated that following the ‘escape attempt’ they should strengthen security measures at the prison, that they were ungrateful, etc etc..” There, in that pit, they remained for many years. Dr. Alberto Neumann, who was detained in the same cell as Michel, was later taken there to certify the death by shooting of another group of prisoners, and there he saw – as they threw the bodies bagged into the ditch – six other bodies already at the bottom; the group which was killed under the so-called notorious “Escape Law”. He tried to memorise the site for future reference. On June 1, 1990 news broke of the discovery of the pit Pisagua, there was a new sense of grief to see all those mummified bodies with an expression of pain on their faces …. 19 bodies were found and a few unidentified remains. Neither Michel, nor his two companions killed on Septembr 29 were found, ever. A witness under condition of anonymity, declared that in 1978 when the military dug up remains to throw into the sea to hide their crimes, they dug into the side of the pit and removed an undetermined number of bodies, which were then brutally burnt and crushed and thrown into the sea. The life of this joyful young man was very brief, but intense, leaving a lasting and deep impression on all those who knew him. Written by his sister Leila Nash. The judicial investigation into the murder of Michael Nash is still underway. Many soldiers are on trial for this crime. Michel Selim Nash Sáez, nació el 1 de Julio de 1954 en Santiago de Chile. Era un bebé hermoso, de ojos grandes y largas pestañas que le daban un aire soñador. Curioso y ansioso de aprender. Primer hijo varón, de padre de ascendencia Siria. Regalón en la familia, querido por sus tías y abuela, adorado por sus padres. Tuvo la suerte que el padre tuviese, por su trabajo, mucho tiempo para estar con él, por lo que gran parte del tiempo estaban ambos padres en casa. Las horas de almuerzo siempre fueron de conversación de uno y mil temas, de todo se conversaba: de ciencias, historia, política, descubrimientos, etc. El papá era comunista y conversaba respecto de sus ideas, pero siempre amplio de criterio, integrándolas con la vida diaria, con sus contradicciones. Era una época de grandes y vistosos avances y descubrimientos, vimos al primer cosmonauta la perrita Laika, el primer humano cosmonauta, la primera mujer… y luego ver llegar al hombre a la luna, todo eso excitaba la imaginación. Las matemáticas eran parte de las conversaciones, competencias de habilidades numéricas, pruebas del conocimiento de geografía e historia, las revoluciones, los líderes…. y los mártires. El hambre en África, el analfabetismo en América Latina, y en particular en Chile, las nuevas vacunas, los nuevos record de velocidad… tantas cosa que hacían de cada conversación un universo. Fue un niño de una gran imaginación y gran interés por la lectura. Muy sociable por lo que siempre tuvo muchos compañeros de juego y amigos. La lectura de cómics primero y libros después lo llevó a descubrir un vasto mundo, conocimiento que después traspasaba a sus juegos: Tarzán, vaqueros, conquistadores, exploradores, los lugares ignotos eran su mundo en el que volcaba su imaginación y los reproducía en el patio de la casa donde sus amigos eran distribuidos por él en los roles que debían jugar, siendo el papel de capitán de la nave o el jefe de la tribu o el rol que fuera, el de jefe el que siempre él interpretaba. Siempre fue alto y de contextura delgada, de ojos color miel y pelo con leves ondas. Su mirada soñadora le daba un aire gitano que causaba estragos en las mujeres, tanto así que el teléfono no paraba de sonar, siempre tenía alguna cita. Se integró a las Juventudes Comunistas y participaba activamente del cambio que estaba ocurriendo, participó activamente de la campaña de Salvador Allende a la Presidencia, con la convicción que ganaría “Mamá, tienes que votar por Allende” le decía, un poco triste porque él no podría votar ese año, tenía 16. Pero participaba de rayados y pegando afiches, formó una brigada de la UP en un sector principalmente de derecha, conquistaba a las personas porque era muy carismático, convencía con su vehemencia y su propia convicción, las discusiones de política con personas de diversos sectores la hacía sin vacilar, fuesen de su mismo partido u otros de la izquierda o derecha. Daba lo mismo si su interlocutor tenía su misma edad o fuese mayor o menor, era capaz de argüir y fundamentar sus ideas para convencer de lo que estaba planteando. Así lo vimos conversar con personas que eran muy mayores, así como con jóvenes que estaban incursionando en el quehacer político. La brigada llevaba el nombre de un líder del mundo árabe de ese tiempo “Gammal Abdel Nasser. Michel formó el Comando Unidad Popular y luego crearon la Junta de Abastecimiento y Precios para contrarrestar el boicot de alimentos de la oposición a Allende. La mayoría de los comerciantes aceptó participar, se trabajaba honestamente. Sin embargo no faltaban los que llamaban por teléfono amenazando e incluso pusieron una bomba incendiaria en la puerta de nuestra casa. Los años del gobierno de Allende estuvieron llenos de actividad, era una vorágine en la que se vivían intensamente las pasiones por lo que cada uno creía, y se luchaba por ello. Los trabajos voluntarios fueron parte de su vida, salía fuera de Santiago, en 1972 fue a la mina El Salvador a trabajos voluntarios y le tocó trabajar duro, pero lo hacía feliz con la conciencia de estar construyendo. En lo que era propaganda, trabajó duro y firme, de día planificaba, estudiaba y compartía con sus compañeros, y en las noches salía a los rayados. Hubo muchas anécdotas y empleó tanta imaginación en crear nuevos actos para sumar adherentes y restar contendientes. Alcanzó a votar en las elecciones parlamentarias de Marzo de 1973, feliz de votar por primera vez y en apoyo al gobierno de Allende. También tenía en mente que pronto partiría al servicio militar, servicio que quiso hacer de todas maneras “el gobierno necesita soldados del pueblo”. Tan grande era su entusiasmo que un amigo, un año menor, quiso ir a hacer el servicio con él en forma voluntaria y adelantada. Así, en Abril de 1973 partió a Iquique, un largo viaje de tres días en tren. Lleno de ilusión y entusiasmo. En el Regimiento se sintió bien, no dejaba de sociabilizar y conversar, llegando a ser Jefe de Plana Mayor. Jamás ocultó sus pensamientos políticos, así fue que cuando los militares en Santiago realizaron el primer intento de golpe de estado, allá en el regimiento se sintió fuerte, conmocionó a todos y todo cambió, ya no era lo mismo en el ejército, se sentía el peso de la bota militar. Para el 11 de Septiembre de 1973 ya las cosas eran muy distintas, lo llevaron a vigilar en la vía pública a quienes transitaban por allí y a hacer allanamientos en las poblaciones, eso fue muy duro para él. No cuadraba con su concepto de Ejército al servicio del Pueblo, no, para nada. Era otro ejército. Así que el 12 de Septiembre pidió su baja argumentando no estar de acuerdo con el nuevo régimen imperante, se la dieron y a la salida del Regimiento lo detuvieron y lo llevaron al Telecomunicaciones para interrogarlo. Posteriormente al interrogatorio los trasladaron a Michel y su amigo, al campo de concentración de Pisagua en calidad de detenidos. Allá se encontró con muchos otros presos que al ver que era “milico” lo aislaron e ignoraron. Sólo después de ver el mal estado en que volvió de interrogatorio se acercaron a él. Lloraba en silencio en un rincón, y los compañeros se le acercaron para consolarle y darle ánimo. Difícil labor, pues a todos les torturaban. En ese duro régimen estuvo hasta el 29 de Septiembre de 1973, cuando en la mañana llegó un grupo de oficiales a pedir voluntarios para un trabajo. Todos se ofrecieron a ello, pues significaría variar la dura rutina a la que los tenían sometidos. Comenzaron a dar nombres de los voluntarios que irían, pero se dieron cuenta que no requerían voluntarios sino que traían una lista de seis personas a quienes tenían que llevar. De hecho, uno de los que nombraron ese día no había salido al patio porque estaba enfermo, pero lo sacaron y llevaron igual. Los llevaron en un jeep al sector norte de Pisagua, cerca del cementerio, allí los bajaron del Jeep, les hicieron correr y les dispararon hasta matarlos a todos, según un testigo que declaró bajo condición de anonimato, utilizaron una metralleta adosada al Jeep para ello. Luego los tiraron en una fosa, y el comandante del Regimiento llegó de vuelta “indignado” porque habían tratado de fugarse y habían tenido que dispararles, que a raíz de ese intento de fuga deberían endurecerse las medidas de seguridad en el penal, que eran unos mal agradecidos, etc….” . Allí, en esa fosa quedaron por muchos años. Al Doctor Alberto Neumann, quien estuvo detenido en la misma celda que Michel, le llevaron posteriormente para certificar la muerte por fusilamiento de otro grupo de prisioneros, y allí vio que arrojaron los cuerpos ensacados a una fosa, en el fondo de la cual ya había seis cuerpos, que supuso era el grupo de los asesinados bajo la supuesta “Ley de Fuga”. Trató de memorizar el sitio para el futuro. El día 1 de Junio de 1990 se supo la noticia del hallazgo de la fosa de Pisagua, un nuevo dolor al ver todos esos cuerpos momificados con expresión de dolor en sus rostros…. Se encontraron 19 cuerpos y unos pocos restos sin identificar. 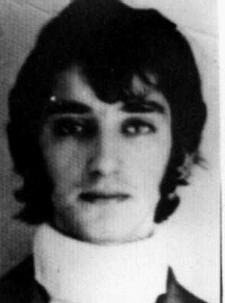 Ni Michel, ni otros dos compañeros asesinados ese día 29 de Septiembre fueron encontrados, nunca. Un testigo declaró, bajo reserva de su identidad, que el año 1978 cuando los militares desenterraron los restos y los fueron a tirar al mar para ocultar el crimen, excavaron en un lado de la fosa y extrajeron una cantidad indeterminada de cuerpos, los que fueron reducidos brutalmente con fuego y luego molidos y arrojados al mar. La vida de este joven alegre fue muy breve, pero intensa, dejando profunda huella en quienes le conocieron. Escrito por su hermana Leila Nash. La investigación judicial por el asesinato de Michel Nash se encuentra en etapa de investigación. Muchos militares están siendo procesados por este crimen.